The new 16 Compact G-Series AQUOS LCD TVs from Sharp features an elegant, slim, compact design that takes advantage of the industry’s thinnest profile of 8.1 cm. All new models use the Kameyama Double-Speed Advanced Super View LCD Panel (120-Hz Frame Rate) to reproduce smooth pictures even with fast-motion images, and feature high definition, fast response times, and wide viewing angles. The new models deliver a living room contrast of 900:1 (dark room contrast ratio of 2000:1) that reproduces crisp, clear, vivid pictures with pure, velvety blacks even in bright living room environments, enabling viewers to truly enjoy the full picture quality a video source has to offer, such as TV programs or movies and videos. The Compact G-Series AQUOS LCD TVs also include a diverse range of attractive features, including 1-Bit Digital Amplifier that reproduces clear, natural sound and the AQUOS Familink, an advanced interface that enables the viewer to comfortably use easily to operate AQUOS Blu-ray Disc Player, AQUOS HD Recorder, and AQUOS Audio System connected to the AQUOS TV. By constantly pursuing picture quality, audio quality, design and environmental performance as the pinnacle of flat-panel TVs, the AQUOS is aiming to be the “entertainment TV of choice,” offering new audio/visual lifestyles in sizes ranging from living room units to personal models. 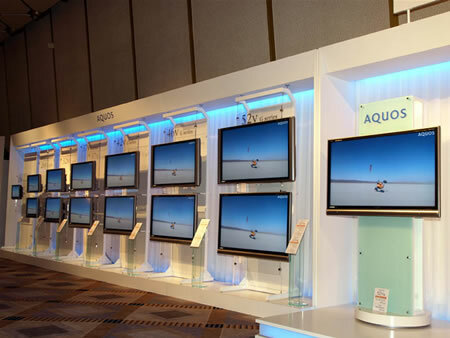 The new Sharp G-Series AQUOS LCD TVs range will be launched in Japan on August 21, 2007.